I rolled out of bed at 8 a.m. Sunday wishing my alarm clock hadn’t interrupted my usual Sunday morning sleep session that usually creeps into the early afternoon. I peeked out the window of my South Oakland apartment and saw heavy, wet snow falling from the gray sky. Today was not the day for me to try to be athletic. Wearing yoga pants that I had never actually worn for yoga purposes, I hopped in an Uber around 9 a.m. The driver noticed the yoga mat I was carrying — borrowed from my mom — and asked me how long I had been practicing yoga. “Ha! Not very long,” I said, chuckling at the idea of someone thinking of me — a person completely new to the art of yoga — as a regular yoga-goer. The driver dropped me off at Market Square in downtown Pittsburgh, at the entrance to the Wintergarden at 1 PPG Place. I met up with a friend of mine who has been heavily involved in yoga for years now, hoping to watch her for guidance. As we entered, I was immediately surprised by the bare openness of the room — all of the decorations had been removed at the end of the holiday season. Before this, I had only ever been in the Wintergarden to see the massive display of Christmas trees and hundreds of gingerbread houses. The floor was covered with dozens people sitting on colorful yoga mats. The majority of the attendees at Sunday’s class were young women, but there were plenty of older women and some men as well — this was a free, all-inclusive event. Attendance was first come, first served, with room for about 300 people on the floor of the Wintergarden — and it was packed to all four glass walls. Immediately after entering, I was intimidated. People were warming up with stretches I had never seen before and proving to be highly flexible. My friend and I threw our mats down at the front of the room, and I hoped I still had some of that flexibility from my days in competitive figure skating and dance. Our instructor for the day was a man named Mitch Riehle. Riehle is a patient care technician at University of Pittsburgh Medical Center, a yoga instructor at Salt Power Yoga and an ambassador for Lululemon, a popular yoga clothing line. Riehle was a strong presence in the room, roaming between mats and calling out directions through his portable headset microphone. “We’re just going to start with some breathing so we can find our balance,” he said. This seemed easy enough to me. Maybe I could handle this yoga thing. As the class went on, Riehle had us doing things like “updog,” “downdog” and “warrior.” Most of these basic yoga poses I had seen in commercials — like the ad for the Aerie yoga pants I bought for comfort instead of yoga. The low difficulty of these poses reassured me, even with my beginner capabilities. A few minutes later, Riehle instructed us to practice standing splits and gave us the opportunity to try some headstands. A woman next to me whipped out the most stunning headstand — with her legs above her in a full split. I didn’t even attempt to stand on my head, knowing that gravity would be working against me in the process of trying to balance on anything except my feet. Although I was intimidated by all of the experienced yogis surrounding me, it proved helpful to peek over at what they were doing to learn the correct way to perform poses. Yoga is also a very self-centered activity, where a yogi will often close their eyes or focus on the ground or the spot directly in front of them. I was relieved to know that no one was watching me closely. “And now to finish, we’re just going to lay back and continue to practice our breathing cycle,” Riehle said. Finally, I could relax my tingling muscles. Through the glass walls of the Wintergarden, I could see the tall glimmering structures of the other PPG buildings — a view to focus on as I repeatedly breathed in and sighed all of the air out of my body. It was the perfect reward for working my body for the past hour. 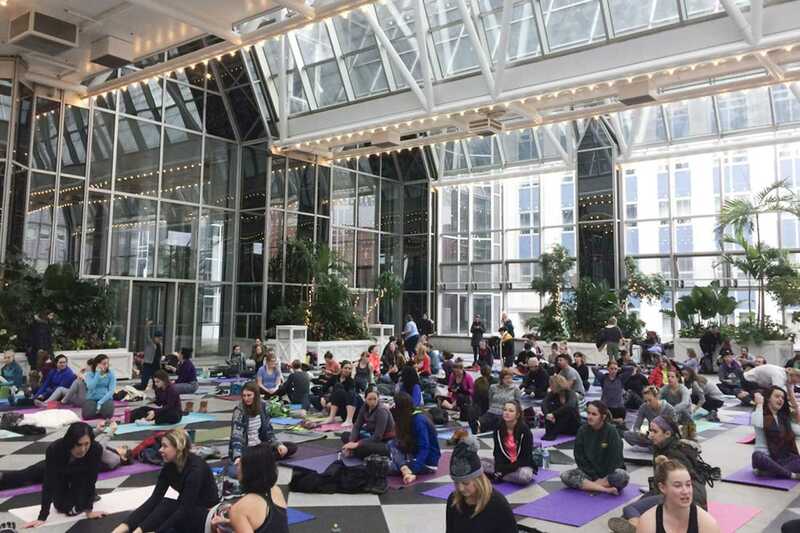 Hosted by Fittsburgh — a media platform sponsored by the UPMC Health Plan centered on community fitness in Pittsburgh — and the Downtown Pittsburgh Partnership, the event attracted beginners like myself as well as more practiced yogis. The free yoga classes in the Wintergarden are taking place every Sunday in February at 10 a.m. with a different expert teaching each week. Next week, Pitt’s own Sally Sherman will be conducting class. Sherman has a Ph.D. in exercise science and teaches yoga, pilates, dance and other physical education classes at Pitt. Wintergarden Yoga turned out to be worth the early morning trip Downtown for me. It left my body sore, but my mind was relaxed and clear. It was a strange feeling — my body hurt, but I wasn’t mad about it. I actually wanted to do it again.